We are engaged in manufacturing and supplying excellent quality Tyre Shiner to our valuable clients. Our new foam technology breaks clear on the tire (with no milky mess) leaving a deep, black, rich shine. In one easy step, the tick, luxuries foam coats the tire, quickly penetrates, lifts and releases dirt and road grime leaving behind an even, rich shine. 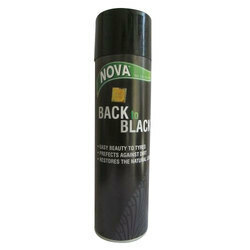 A water based ready to use liquid that effectively shines & protects rubbers surfaces without any harsh solvents. It gives high gloss dressing that features silicon & lime scent. It is highly durable ready to use dressing. Packing Available: 1Ltr, 5 Ltrs, 35 Ltrs, 60 Ltrs. 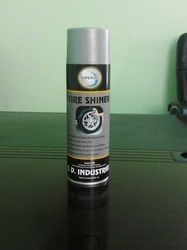 This product can remove smudges on tires efficiently and thoroughly, and also prevent tires from being harden, cracked and color faded out.It returns the brightness and cleanness of tires instantly, makes them long lasting and is harmless to wheel accessories like tire rolls and tire covers. Its advanced formulation keeps tires look cleaner, darker and prevents against browning and premature ageing.Product in its class which gives long lasting satin shine, just spray and drive away.The size of this liquid tire shiner is 525 ml.